A signal filter (202) includes a node (452,456), a first terminal, a second terminal, and energy storage circuitry (432,442) coupled to the node and the first and second terminals. The node receives an input signal (VINP,VINN) and a reference signal (VREFH,VREFL) selectively. The first terminal provides an output signal (V'INN,V'INP) determined by the input signal and the reference signal. The second terminal receives a feedback signal (VOUTN,VOUTP) indicative of the output signal. The energy storage circuitry generates the output signal at the first terminal according to the input signal and the reference signal. The energy storage circuitry also receives the input signal via the node and the feedback signal via the second terminal in alternating fashion. A dominant pole of the signal filter is controlled by the frequency at which the input signal and the feedback signal alternate. This application claims priority to U.S. Provisional Application No. 61/357,181, filed on June 22, 2010 , which is hereby incorporated by reference in its entirety. FIG. 1 illustrates a conventional signal monitoring system 100. The signal monitoring system 100 includes a differential resistor-capacitor (RC) low-pass filter (LPF) 102 and a differential analog-to-digital converter (ADC) 104. The differential ADC 104 includes input terminals INP and INN coupled to the differential RC LPF 102. The RC LPF 102 receives an input signal VIN, blocks or attenuates high-frequency noises mixed in the input signal VIN, and passes a low-frequency portion V'IN of the input signal VIN to the ADC 104. The RC LPF 102 can generate a pair of output signals VOUT1 and VOUT2, and control a difference between the output signals VOUT1 and VOUT2 to be equal to the V'IN multiplied by a gain g102 of the RC LPF 102, e.g., VOUT2―VOUT1 = VIN*g102. The ADC 104 can receive a differential signal VD, e.g., VD = VOUT2―VOUT1, and generate a digital signal 106 indicative of the differential signal VD. However, in the conventional signal monitoring system 100, there is a tradeoff between the system response speed and the monitoring accuracy. More specifically, according to the characteristics of a low-pass filter, a dominant pole fp (or a first pole) of the RC LPF 102 is given by: fp = 1/(2π*R*C), where R represents an equivalent resistance of the RC LPF 102, and C represents an equivalent capacitance of the RC LPF 102. Since the equivalent resistance and the equivalent capacitance of the RC LPF 102 are constant, the dominant pole fp of the RC LPF 102 is also constant. Thus, the bandwidth of the RC LPF 102 that is determined by the dominant pole fp is also constant. On one hand, in order to increase the response speed for the RC LPF 102 to vary the output signals VOUT1 and VOUT2 according to a variation of the input signal VIN, the bandwidth of the RC LPF 102 needs to increase. However, the larger the bandwidth of the RC LPF 102, the more the noise mixed in the input signal VIN can be passed to the ADC 104. In other words, increasing the bandwidth of the RC LPF 102 filter can decrease the monitoring accuracy of the signal monitoring system 100. On the other hand, in order to decrease the noise passed to the ADC 104, the bandwidth of the RC LPF 102 needs to decrease. However, the narrower the bandwidth of the RC LPF 102, the slower the response speed of the RC LPF 102. Thus, there is a tradeoff between response speed and monitoring accuracy. It is difficult for the conventional signal monitoring system 100 to enhance both response speed and monitoring accuracy. In addition, if the input signal VIN ranges from 0V to 5V, and the gain g102 of the RC LPF 102 is equal to one, then the differential signal VD from the RC LPF 102 to the ADC 104 also ranges from 0V to 5V. Since the ADC 104 is a bipolar input ADC, the differential input range of the ADC 104 is at least―5V to 5V. If the ADC 104 is a 12-bit ADC, the least significant bit (LSB) of the ADC 104 is given by: LSB = 5/211= 2.44 mV. The larger the LSB, the lower the measurement precision of the ADC 104. However, in the signal monitoring system 100, half of the differential input range of the ADC 104, e.g., the range from ―5V to 0V, is wasted. In one embodiment, a signal filter includes a node, a first terminal, a second terminal, and energy storage circuitry coupled to the node and the first and second terminals. The node receives an input signal and a reference signal selectively. The first terminal provides an output signal determined by the input signal and the reference signal. The second terminal receives a feedback signal indicative of the output signal. The energy storage circuitry generates the output signal at the first terminal according to the input signal and the reference signal. The energy storage circuitry also receives the input signal via the node and the feedback signal via the second terminal in alternating fashion. A dominant pole of the signal filter is controlled by the frequency at which the input signal and the feedback signal alternate. In a further embodiment, a method for filtering a first input signal using a signal filter comprises: receiving, at energy storage circuitry, said first input signal and a first reference signal selectively; generating a first output signal according to said first input signal and said first reference signal; receiving, at said energy storage circuitry, a feedback signal indicative of said first output signal, wherein said first input signal and said feedback signal are received at said energy storage circuitry in alternating fashion; and controlling a dominant pole of said signal filter by controlling the frequency at which said first input signal and said feedback signal are received at said energy storage circuitry. In a further embodiment, a signal monitoring system comprises a signal filter operable for generating a first output signal according to a first input signal and a first reference signal and receiving a feedback signal indicative of said first output signal, said signal filter comprising a plurality of switches to deliver said first input signal and said reference signal to energy storage circuitry in said signal filter selectively, and deliver said first input signal and said feedback signal to said energy storage circuitry selectively; said signal monitoring system further comprising a signal generator coupled to said signal filter and operable for generating a control signal to control said plurality of switches, and controlling a frequency of said control signal to control a dominant pole of said signal filter. Also, said signal monitoring system may further comprise an analog-to-digital converter coupled to said signal filter and operable for generating a digital signal indicative of a difference between said first output signal and a second output signal of said signal filter. Also, in said signal monitoring system, said energy storage circuitry may comprise switched-capacitor circuitry. Also, in said signal monitoring system, said control signal may control said switches so that, in a first time interval, a capacitor receives said first input signal via a first end of said capacitor and may receive a second reference signal via a second end of said capacitor, and wherein in a second time interval, said capacitor may receive said first reference signal via said first end and may provide said first output signal via said second end. Also, in said signal monitoring system, a difference between said first output signal and a second output signal of said signal filter may be indicative of a difference between said first input signal and a second input signal of said signal filter minus a predetermined level that is within a range of said difference between said first and second input signals. Also, said signal monitoring system may further comprise a multiplexer to select said first input signal from a plurality of signals. Further, said signal generator may control said control signal to have a first frequency when said first input signal is switched from a first signal of said plurality of signals to a second signal of said plurality of signals, and may control said control signal to have a second frequency that is less than said first frequency when a time interval expires. FIG. 1 illustrates a conventional signal monitoring system. FIG. 2 illustrates a block diagram of an example of a battery monitoring system, in accordance with one embodiment of the present invention. FIGs. 3A to 3C illustrate frequency diagrams of examples of a clock signal, in accordance with embodiments of the present invention. FIGs. 4A and 4B illustrate a circuit diagram of an example of a switched-capacitor filter, in accordance with one embodiment of the present invention. FIG. 5 illustrates waveform diagrams of examples of clock signals. in accordance with one embodiment of the present invention. FIGs. 6A and 6B illustrate diagrams of examples of equivalent circuits of the switched-capacitor filter in FIGs. 4A and 4B, in accordance with one embodiment of the present invention. FIG. 7 illustrates a flowchart of examples of operations performed by a signal monitoring system, in accordance with one embodiment of the present invention. Reference will now be made in detail to the embodiments of the present invention. While the invention will be described in conjunction with these embodiments, it will be understood that they are not intended to limit the invention to these embodiments. On the contrary, the invention is intended to cover alternatives, modifications and equivalents, which may be included within the spirit and scope of the invention as defined by the appended claims. Furthermore, in the following detailed description of the present invention, numerous specific details are set forth in order to provide a thorough understanding of the present invention. However, it will be recognized by one of ordinary skill in the art that the present invention may be practiced without these specific details. In other instances, well known methods, procedures, components, and circuits have not been described in detail as not to unnecessarily obscure aspects of the present invention. In one embodiment, the present invention provides a signal monitoring system that includes a differential filter and a differential conversion circuit, e.g., an analog-to-digital converter (ADC). The signal monitoring system controls a dominant pole of the filter so as to control a bandwidth of the filter. By controlling the bandwidth of the filter, the response speed of the signal monitoring system and the monitoring accuracy of the signal monitoring system are enhanced. In addition, the filter can control the level of a differential input signal of the ADC, such that the differential input range of the ADC is fully utilized. The differential input range of the ADC can also be reduced to enhance the measurement precision of the ADC. FIG. 2 illustrates a block diagram of an example of a battery monitoring system 200, in accordance with one embodiment of the present invention. The battery monitoring system 200 includes a set of cells 240_1, 240_2,..., 240_N, e.g., Lithium-lon battery cells or lead-acid battery cells. The battery monitoring system 200 further includes a signal monitoring system 250 operable for monitoring cell voltages of the cells 240_1-240_N. The signal monitoring system 250 includes a multiplexer 210, a signal filter 202, e.g., a switched-capacitor (SC) filter, an ADC 220, e.g., a differential ADC, and a signal generator 230. In one embodiment, the signal filter 202 is a differential switched-capacitor low-pass filter. As shown in FIG. 2, the multiplexer 210 receives a set of signals VIN(1), VIN(2), ..., VIN(N), and a signal reference VREF0, and provides input signals VINN and VINP to the signal filter 202. In one embodiment, the signal reference VREF0 is used as the common ground for the signals VIN(1), VIN(2), ..., VIN(N). The signal reference VREF0 can be grounded or provided by a voltage reference source (not shown in FIG. 2). In the example of FIG. 2, the input signals VIN(1), VIN(2), ...,VIN(N) are terminal voltages at the positive terminals of the cells 240_1-240_N, respectively, and the signal reference VREF0 is grounded. In one embodiment, the input signal VINN can be grounded. Thus, the signal filter 202 receives a single-ended signal, e.g., the input signal VINP, and generates a differential output signal to the ADC 220. The input signal VINP can be selected from cell voltages V1, V2, ..., VN of the cells 240_1, 240_2,..., 240_N. By way of example, the multiplexer 210 receives the terminal voltages VIN(1), VIN(2), ..., VIN(N) and the signal reference VREF0, and generates the cell voltages V1, V2, ..., VN that are respectively equal to the differences VIN(1)―VREF0, VIN(2)―VIN(1),...,VIN(N)-VIN(N-1). The multiplexer 210 further selects the input signal VINP from the cell voltages V1, V2, ..., VN and delivers the input signal VINP to the signal filter 202. In another embodiment, the input signals VINN and VINP are selected from the signals VIN(1), VIN(2), ..., VIN(N) and VREF0. For example, the multiplexer 210 includes a set of switching channels to deliver two signals selected from the signals VIN(1), VIN(2), ..., VIN(N) and VREF0 to the signal filter 202. The set of switching channels can have various structures. In one embodiment, the multiplexer 210 turns on two switching channels to deliver the signals VIN(1) and VREF0 to the signal filter 202, such that the signal filter 202 receives a differential input signal VIN(1)―VREF0, e.g., the cell voltage V1. Similarly, the multiplexer 210 can turn on the switching channels sequentially, such that the signal filter 202 can receive the cells voltages V1, V2, ..., VN sequentially. The signal filter 202 includes an input terminal INP1 to receive a first input signal VINP, an input terminal INN1 to receive a second input signal VINN, an output terminal OUTN1 to provide an output signal VOUTN, and an output terminal OUTP1 to provide an output signal VOUTP. The signal filter 202 receives a differential input signal that is equal to the difference between the input signals VINN and VINP, and generates a differential output signal that is equal to the difference between the output signals VOUTN and VOUTP. The differential output signal VOUTP-VOUTN indicates the differential input signal VINP―VINN, e.g., the difference VOUTP-VOUTN is proportional to the difference VINP― VINN. The ADC 220 receives the differential output signal VOUTP―VOUTN and generates a digital signal 226 indicative of the differential output signal VOUTP―VOUTN, which also indicates the differential input signal VINP―VINN. In one embodiment, the signal generator 230 can be a clock signal generator that includes one or more oscillators to generate control signals such as clock signals CLK1 and CLK2 to control the signal filter 202. The clock signals CLK1 and CLK2 control a dominant pole (or a first pole) fp0 of the signal filter 202 according to a status of the differential input signal VINP―VINN. In the example of FIG. 2, the signal generator 230 is arranged outside of the signal filter 202. However, the signal generator 230 can instead be arranged inside the signal filter 202. Advantageously, a differential output range of the signal filter 202 can be controlled such that the signal monitoring system 250 can fully utilize a differential input range of the ADC 220 and decrease the differential input range of the ADC 220, so as to enhance the measurement precision of the ADC 220. Furthermore, the response speed of the signal monitoring system 250, e.g., the speed at which the output signals VOUTN and VOUTP vary in response to variations in the input signals VINN and VINP, increases. The monitoring accuracy of the signal monitoring system 250, e.g., the accuracy of the digital signal 226 indicating the difference between the input signals VINN and VINP, is also improved. More specifically, in one embodiment, the signal filter 202 receives the first and second input signals VINP and VINN, and generates a first output signal V[NN and a second output signal V'INP (not shown in FIG. 2) according to the input signals VINN and VINP and according to a reference signal VREFH and a reference signal VREFL. The reference signals VREFH and VREFL can be provided by reference signal sources (not shown in FIG. 2) implemented inside or outside of the signal filter 202. The signal filter 202 controls a voltage level of the output signal VINN and a voltage level of the output signal V'INP, such that the difference between the output signals V'INN and V'INP is equal to the difference between the input signals VINN and VINP minus the difference between the reference signals VREFH and VREFL. In other words, the difference between the output signals V'INN and V'INP can be given by: Vʹ INP - Vʹ INN = V INP - V INN - V REFH - V REFL . In one embodiment, the signal filter 202 receives a differential input signal VINP-VINN, transforms the differential input signal VINP-VINN into a differential signal V'INP-V'INN, and generates a differential output signal VOUTP-VOUTN that is equal to the differential signal V'INP-V'INN multiplied by a gain g202 of the signal filter 202. According to equation (1), the differential output signal VOUTP-VOUTN can be given by: V OUTP - V OUTN = V INP - V INN - V REFH - V REFL * g 202 . V OUTN = V COM - V INP - V INN - V REFH - V REFL * g 202 / 2. Ranges of the output signals VOUTP and VOUTN thus are controlled by the output common-mode voltage VCOMand the reference signals VREFH and VREFL. In one embodiment, the reference signals VREFH and VREFL are set such that the difference VREFH―VREFL is within the range of the differential input signal VINP― VINN. Accordingly, the maximum absolute value of the difference V'INP―V'INN, e.g., the maximum of the level |V'INP―V'INN|, is less than the maximum absolute value of the difference VINP-VINN, e.g., the maximum of the level |VINP-VINN|. As such, the differential input range of the ADC 220 can be reduced. By way of example, the differential input signal VINP―VINN ranges from 0V to a maximum level VMAX. The reference signals VREFH and VREFL are set such that the difference VREFH―VREFL is equal to half of the maximum level VMAX, e.g., VREFH―VREFL = VMax/2. Thus, according to equations (1) and (2), the following equation is obtained: V OUTP - V OUTN = V INP - V INN - V MAX / 2 * g 202 . Since the differential input signal VINP―VINN ranges from 0V to the maximum level VMAX, the differential output signal VOUTP―VOUTN can range from the level -(VMAX /2) * g202 to the level (VMAX/2)*g202. If the gain g202 of the signal filter 202 is equal to one and the maximum level VMAX is equal to 5V, then the differential output signal VOUTP―VOUTN ranges from -2.5V to 2.5V. Thus, the differential input range of the ADC 220 can be set to be at least from -2.5V to 2.5V. As such, the differential input range of the ADC 220 is fully utilized. If the ADC 220 is a 12-bit ADC, the least significant bit (LSB) of the ADC 220 is given by: LSB = 2.5/211= 1.22 mV. Compared with the ADC 104 of the conventional signal monitoring system 100 in FIG. 1, the ADC 220 in FIG. 2 has a smaller differential input range and a smaller LSB. As a result, the ADC 220 can more accurately measure the differential output signal VOUTP-VOUTN. In one such embodiment, the ADC 220 generates a digital signal DIGIN representative of the differential output signal VOUTP―VOUTN, and generates the digital signal 226 that is equal to the digital signal DIGIN plus a reference digital signal DIGREF. The reference digital signal DIGREF represents the difference VREFH―VREFL. Thus, the digital signal 226 represents the differential input signal VINP―VINN. where CSC represents a capacitance parameter in the switched-capacitor circuit, and fCLK represents the frequency of the control signal SCF_CLK that controls the switches in the switched-capacitor circuit. where REQV represents an equivalent resistance of the signal filter 202, and CEQV represents an equivalent capacitance of the signal filter 202. The equivalent resistance REQV of the signal filter 202 is provided by the switched-capacitor circuit, and therefore is equal to the equivalent resistance RSC of the switched-capacitor circuit. Based on equations (5) and (6), the following equation is obtained: f p ⁢ 0 = f CLK * C SC / 2 ⁢ π * C EQV . Thus, the dominant pole fp0 of the signal filter 202 increases if the frequency fCLK increases, and decreases if the frequency fCLK decreases. The signal generator 230 can increase the frequency FCLK of the control signal SCF_CLK to increase the dominant pole fp0 of the signal filter 202, and therefore to increase the bandwidth of the signal filter 202. The signal generator 230 can also decrease the frequency fCLK to decrease the dominant pole fp0, and therefore to decrease the bandwidth of the signal filter 202. FIG. 3A illustrates a frequency diagram of an example of the control signal SCF_CLK that controls the switches in the signal filter 202, in accordance with one embodiment of the present invention. FIG. 3A is described in combination with FIG. 2. As shown in FIG. 3A, the frequency fCLK of the control signal SCF_CLK can have a frequency fCLK1 and a frequency fCLK2 that is less than the frequency fCLK1. By way of example, the signal generator 230 selects the control signal SCF_CLK from the clock signals CLK1 and CLK2 to control the dominant pole fp0 of the signal filter 202 according to the status of the differential input signal VINP―VINN. The clock signal CLK1 has the frequency fCLK1, and the clock signal CLK2 has the frequency fCLK2. The multiplexer 210 can select and deliver a cell voltage from the cell voltages V1, V2, ..., VN to the signal filter 202 sequentially, such that the signal monitoring system 250 can monitor each of the cell voltages V1, V2, ..., VN. In one embodiment, when the differential input signal VINP-VINN is switched from a first signal (e.g., the cell voltage V1) to a second signal (e.g., the cell voltage V2), e.g., at time t0, the signal generator 230 selects the clock signal CLK1 that has the frequency fCLK1 to control the signal filter 202. The signal generator 230 can include a timer to count time. When a preset time interval TPRE1 expires, e.g., at time t1. the signal generator 230 selects the clock signal CLK2 that has the frequency fCLK2 to control the signal filter 202. When a preset time interval TPRE2 expires, e.g., at time t2, the differential input signal VINP-VINN can be switched from the second signal (e.g., the cell voltage V2) to a third signal (e.g., the cell voltage V3). At time t2, the signal generator 230 selects the clock signal CLK1 to control the signal filter 202 again. As a result, when the differential input signal VINP―VINN is switched from one signal to another signal, the signal filter 202 can increase its bandwidth to increase the response speed. When the preset time interval TPRE1 expires, the signal filter 202 can decrease its bandwidth to enhance the accuracy of the ADC 220. In one embodiment, the signal generator 230 selects the control signal SCF_CLK from the clock signals CLK1 and CLK2 to control the signal filter 202. However, the invention is not so limited. FIG. 3B and FIG. 3C illustrate frequency diagrams of other examples of the control signal SCF_CLK, in accordance with embodiments of the present invention. FIG. 3B and FIG. 3C are described in combination with FIG. 2. In the example of FIG. 3B, the signal generator 230 selects the control signal SCF_CLK from three or more clock signals that have different frequencies, e.g., fCLK1, f1, f2, and fCLK2, to control the signal filter 202. In the example of FIG. 3C, the signal generator 230 controls the control signal SCF_CLK to have a higher frequency fCLK1 when the differential input signal VINP-VINN is switched from one signal to another signal, e.g., at time to, t2, t4, etc., and then decreases the frequency of the control signal SCF_CLK to a lower frequency fCLK2 continuously as shown in FIG. 3C. FIGs. 4A and 4B illustrate a circuit diagram of an example of the signal filter 202 in FIG. 2, in accordance with one embodiment of the present invention. The signal filter 202 includes filter circuitry and a differential amplification circuitry 402 coupled to the filter circuitry. The filter circuitry includes multiple switches 416_1-416_2, 418_1-418_2, 412_1-412_6 and 414_1-414_6, multiple capacitors 432, 442, 434, 444, 436, 446, 438, 448, 404 and 406, and a set of signal lines 422, 424, 428 and 426. As shown in FIGs. 4A and 4B, each switch of the switches 416_1-416_2, 418_1-418_2, 412_1-412_6 and 414_1-414_6 includes a control terminal labeled "CTL" (hereinafter, CTL terminal), a terminal labeled "S1" (hereinafter, S1 terminal), and a terminal labeled "S2" (hereinafter, S2 terminal). A control signal at the CTL terminal can control the status of the switch. For example, if the control signal is logic high, the switch is turned on and a signal can be transferred between the S1 terminal and the S2 terminal. If the control signal is logic low, the switch is turned off. A first end 452 of the capacitor 432 is coupled to receive the input signal VINP via the switch 416_1 and is coupled to receive the reference signal VREFH via the switch 418_1. A second end 454 of the capacitor 432 is coupled to receive a reference signal, e.g., the reference signal VREFH or another reference signal V'REF not shown in FIG. 4A, via the switch 412_1, and is coupled to provide the output signal V'INN via the capacitor 436 and the switch 414_4. A first end 456 of the capacitor 442 is coupled to receive the input signal VINN via the switch 416_2 and is coupled to receive the reference signal VREFL via the switch 418_2. A second end 458 of the capacitor 442 is coupled to receive the same reference signal that is received by the switch 412_1, e.g., the reference signal VREFH or the reference signal V'REF not shown in FIG. 4A, via the switch 412_2, and is coupled to provide the output signal V'INP via the capacitor 446 and the switch 414_5. In addition, two ends of each of the capacitors 434, 436, 446 and 444 are coupled to receive the same reference signal that is received by the switches 412_1 and 412_2, e.g., the reference signal VREFH or the reference signal V'REF not shown in FIG. 4A, via corresponding switches 412_1-412_6. The capacitors 434 and 444 are also coupled to receive feedback signals VOUTN and VOUTP via the switches 414_3 and 414_6 respectively. The switches 414_1 and 414_2 are coupled to control the capacitors 438 and 448. The filter circuitry receives the input signals VINN and VINP and the reference signals VREFH and VREFL through input capacitors 432 and 442, and receives feedback signals VOUTN and VOUTP through feedback capacitors 434 and 444. The filter circuitry further generates the output signals V'INN and V'INP in accordance with equation (1). The differential amplification circuitry 402 receives the outputs signals V'INN and V'INP and generates the output signals VOUTN and VOUTP in accordance with equations (3a) and (3b). In one embodiment, the signal filter 202 receives the control signal SCF_CLK to control the switches 416_1-416_2. 418_1-418_2, 412_1-412_6 and 414_1-414_6, such that the signal filter 202 receives the input signal VINP and the reference signal VREFH via the node 452 in alternating fashion and generates the output signal V'INN determined by the input signal VINP and the reference signal VREFH. The signal filter 202 can also receive the input signal VINN and the reference signal VREFL via the node 456 in alternating fashion and generates the output signal V'INP determined by the input signal VINN and the reference signal VREFL. Accordingly, the difference between the output signals V'INP and V'INN can be given by equation (1). Moreover, the signal filter 202 receives the differential input signal VINP―VINN and the differential output signal VOUTP―VOUTN in alternating fashion, such that an equivalent resistance of the signal filter 202 is controlled by the frequency at which the differential input signal VINP― VINN and the differential output signal VOUTP―VOUTN alternate, e.g., the frequency fCLK of the control signal SCF_CLK, in accordance with equation (5). Accordingly, the dominant pole fp0 of the signal filter 202 is controlled by controlling the frequency FCLK of the control signal SCF_CLK. More specifically, the switches 416_1 and 416_2 are coupled to the signal line 426 and controlled by a clock signal PH1B at the signal line 426. The switches 418_1 and 418_2 are coupled to the signal line 428 and controlled by a clock signal PH2B at the signal line 428. The switches 412_1-412_2 (in FIG. 4A) and the switches 412__3-412_6 (in FIG. 4B) are coupled to the signal line 422 and controlled by a clock signal PH1A at the signal line 422. The switches 414_1-414_2 (in FIG. 4A) and the switches 414_3-414_6 (in FIG. 4B) are coupled to the signal line 424 and controlled by a clock signal PH2A at the signal line 424. A non-overlapping clock generator 450 can receive the control signal SGF_CLK, e.g. a clock signal, and generate clock signals PH1A, PH2A, PH1B and PH2B with the frequency fCLK of the control signal SCF_CLK or with a frequency that is directly proportional to the frequency fCLK. The non-overlapping clock generator 450 also controls phase differences between the clock signals PH1A, PH2A, PH1B and PH2B. Examples of waveforms of the clock signals PH1A, PH2A, PH1B and PH2B are illustrated in FIG. 5, in accordance with one embodiment of the present invention. As shown in FIG. 5, the clock signals PH1A and PH2A are a pair of non-overlapping signals, and the clock signals PH1B and PH2B are a pair of non-overlapping signals. More specifically, if the clock signal PH1A is logic high, the clock signal PH2A is logic low; if the clock signal PH2A is logic high, the clock signal PH1A is logic low. Similarly, if the clock signal PH1B is logic high, the clock signal PH2B is logic low; if the clock signal PH2B is logic high, the clock signal PH1B is logic low. In addition, the clock signal PH1B is a delayed version of the clock signal PH1A, and the clock signal PH2B is a delayed version of the clock signal PH2A. By way of example, a rising edge of the clock signal PH1A occurs at time tP0, and a corresponding rising edge of the clock signal PH1B occurs at time tp1 that is Δt delayed from the time tP0. In addition, the clock signals PH1A and PH1B have the same duty cycle. Similarly, a rising edge of the clock signal PH2A occurs at time tP4, and a corresponding rising edge of the clock signal PH2B occurs at time tP5 that is At delayed from the time tP4. In addition, the clock signals PH2A and PH2B have the same duty cycle. Compared with cycle times of the clock signals PH1A, PH2A, PH1B and PH2B, the delayed time At is relatively short. During time interval tP1 to tP2, the clock signals PH1A and PH1B are logic high, and the clock signals PH2A and PH2B are logic low. Accordingly, the switches 416_1-416_2 and the switches 412_1-412_6 are on, and the switches 418_1-418_2 and the switches 414_1-414_6 are off. An example of an equivalent circuit 600 of the signal filter 202 during the time interval tP1 to tP2 is shown in FIG. 6A. During the time interval tP5 to tP6, the clock signals PH1A and PH1B are logic low, and the clock signals PH2A and PH2B are logic high. Accordingly, the switches 416_1-416_2 and the switches 412_1-412_6 are off, and the switches 418_1-418_2 and the switches 414_1-414_6 are on. An example of an equivalent circuit 600' of the signal filter 202 during the time interval tP5 to tP6 is shown in FIG. 6B. As shown in FIG. 6A, during time interval tP1 to tP2, the capacitor 432 receives the input signal VINP via the first end 452 of the capacitor 432 and receives the reference signal VREFH via the second end 454 of the capacitor 432. A voltage VC1 across the capacitor 432 is equal to the difference between the reference signal VREFH and the input signal VINP, e.g., VC1 = VREFH―VINP. The capacitor 442 receives the input signal VINN via the first end 456 of the capacitor 442 and receives the reference signal UREFH via the second end 458 of capacitor 442. A voltage VC3 across the capacitor 442 is equal to the difference between the reference signal VREFH and the input signal VINN, e.g., VC3 = VREFH―VINN. In addition, two ends of each of the capacitors 434, 436, 446 and 444 receive the reference signal VREFH. Voltages across the capacitors 434, 436, 446 and 444 are zero volts. As shown in FIG. 6B, during time interval tP5 to tP6, the capacitor 432 receives the reference signal VREFH via the first end 452 of the capacitor 432 and provides the output signal V'INN which is transferred to the differential amplification circuitry 402 via the second end 454 of the capacitor 432 and via the capacitor 436. The capacitor 442 receives the reference signal VREFL via the first end 456 of the capacitor 442 and provides the output signal V'INP which is transferred to the differential amplification circuitry 402 via the second end 458 of the capacitor 442 and via the capacitor 446. More specifically, since the voltage VC1 of the capacitor 432 and the voltage VC2 of the capacitor 436 do not change abruptly, the voltage at the second end 454 of the capacitor 432 can be equal to the reference signal VREFH plus the level VREFH―VINP, and the output signal V'INN can be equal to the level VREFH+VREFH―VINP plus zero volts. In other words, the output signal V'INN can be given by: Vʹ INN = 2 * V REFH - V INP . Similarly, the voltage at the second end 458 of the capacitor 442 can be equal to the reference signal VREFL plus the level VREFH―VINN, and the output signal V'INP can be equal to the level VREFL+VREFH―VINP plus zero volts. In other words, the output signal V'INP can be given by: Vʹ INP = V REFL + V REFH - V INN . As a result, the difference between the output signals V'INN and V'INP is obtained in accordance with equation (1). In other words, in one embodiment, the node 452 of the energy storage circuitry 602 receives the input signal VINP and the reference signal VREFH selectively. The node 456 of the energy storage circuitry 602 can receive input signal VINN and the reference signal VREFL selectively. The S2 terminal of the switch 414_4 provides the output signal V'INN determined by the input signal VINP and the reference signal VREFH. The S2 terminal of the switch 414_5 provides the output signal V'INP determined by the input signal VINN and the reference signal VREFL. The S2 terminal of the switch 414_3 receives the feedback signal VOUTN indicative of the output signal V'INN. The S2 terminal of the switch 414_6 receives the feedback signal VOUTP indicative of the output signal V'INP. The energy storage circuitry 602 generates the output signal V'INN at the S2 terminal of the switch 414_4 and the output signal V'INP at the S2 terminal of the switch 414_5. The difference between the output signals V'INN and V'INP is obtained in accordance with equation (1). Vʹ INP = V REFL + Vʹ REF - V INN . The difference between the output signals V'INN and V'INP can also be obtained in accordance with equation (1). Furthermore, the energy storage circuitry 602 can receive the input signal VINP via the node 452 and the feedback signal VOUTP via the S2 terminal of the switch 414_3 in alternating fashion, and receive the input signal VINN via the node 456 and the feedback signal VOUTN via the S2 terminal of the switch 414_6 in alternating fashion. As such, the dominant pole fp0 of the signal filter 202 is controlled by the frequency at which the input signal VINP and the feedback signal VOUTP alternate or the frequency at which the input signal VINN and the feedback signal VOUTN alternate. By way of example, as shown in FIG. 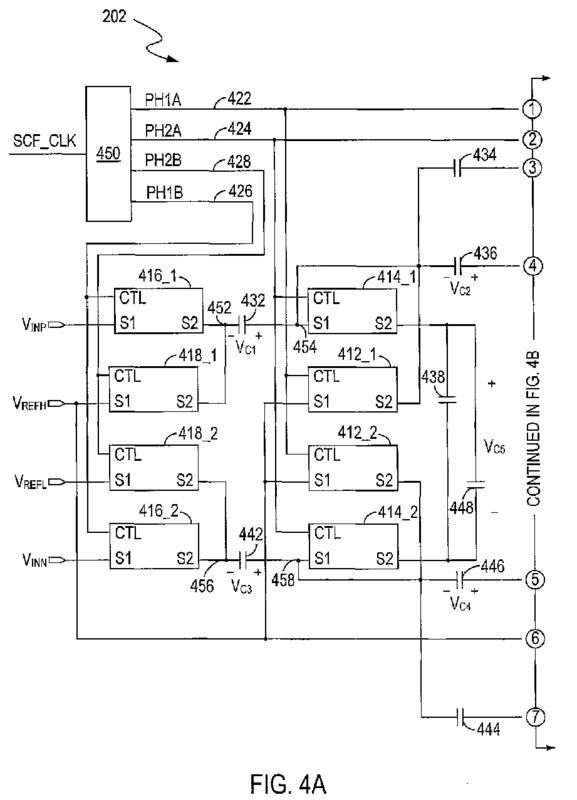 6A, during the time interval tP1 to tP2, charge stored in the energy storage circuitry 602 that includes the capacitors 432, 442, 434, 444, 436 and 446 is controlled by the differential input signal VINP-VINN. For example, charge QSC stored in the energy storage circuitry 602 is given by Csc*(VINP―VINN). CSC represents a capacitive parameter in the energy storage circuitry 602. As shown in FIG. 6B, during the time interval tP5 to tP6, charge stored in the energy storage circuitry 602 is controlled by the differential output signal VOUTP-VOUTN. For example, charge Q'SC stored in the energy storage circuitry 602 is given by CSC*(VOUTP―VOUTN). The control signal SCF_CLK can control the switches 416_1-416_2, 418_1-418_2, 412_1-412_6 and 414_1-414_6, such that charge stored in the energy storage circuitry 602 is controlled by the differential input signal VINP―VINN and the differential output signal VOUTP―VOUTN alternately with the frequency FCLK. During a time cycle TCLK, e.g., 1/fCLK, change ΔQ in the charge stored in the energy storage circuitry 602 is equal to Q1 SC-QSC=CSC *[(VOUTP―VOUTN)-(VINP-VINN)]. Thus, an average current ISC through the energy storage circuitry 602 is equal to ΔQ/TCLK=CSC*fCLK*[(VOUTP―VOUTN)-(VINP-VINN)]. In addition, an equivalent resistance RSC in the energy storage circuitry 602 is equal to [(VOUTP―VOUTN)-(VINP―VINN)]/ISC. Accordingly, the equivalent resistance RSC can be given by RSC=1/(CSC*fCLK). As a result, the dominant pole fp0 of the signal filter 202 is controlled by the frequency fCLK. where f'CLK represents the switching frequency of the switches 416_1-416_2, 418_1-418_2, 412_1-412_6 and 414_1-414_6. Accordingly, the dominant pole fp0 of the signal filter 202 can be controlled by controlling the frequency fCLK of the control signal SCF_CLK. In the example of FIGs. 4A and 4B, the signal filter 202 includes the switches 418_2 and 416_2. However, in another embodiment, the switches 418_2 and 416_2 can be omitted. In one such embodiment, the reference signal VREFL and the input signal VINP can be grounded. The signal filter 202 can receive a single-ended input signal VINP and generate a differential output signal VOUTP―VOUTN indicative of the input signal VINP. FIG. 7 illustrates a flowchart 700 of examples of operations performed by a signal monitoring system, in accordance with one embodiment of the present invention. FIG. 7 is described in combination with FIG. 2, FIGs. 3A to 3C, FIGs. 4A and 4B, FIG. 5, and FiGs. 6A and 6B. In block 702, the input signal VINP and the reference signal VREFH are received at the energy storage circuitry 602, e.g., at the node 452, selectively. The input signal VINN and the reference signal VREFL are also received at the energy storage circuitry 602, e.g., at the node 456, selectively. In block 704, the output signal V'INN is generated, e.g., at the S2 terminal of the switch 414_4, according to the input signal VINP and the reference signal VREFH, and the output signal V'INP is generated, e.g., at the S2 terminal of the switch 414_5, according to the input signal VINN and the reference signal VREFL. In block 706, the feedback signal VOUTN indicative of the output signal V'INN is received at the energy storage circuitry 602, e.g., at the S2 terminal of the switch 414_3, and the feedback signal VOUTP indicative of the output signal V'INP is received at the energy storage circuitry 602, e.g., at the S2 terminal of the switch 414_6. The input signal VINP and the feedback signal VOUTN are received at the energy storage circuitry 602 in alternating fashion, and the input signal VINN and the feedback signal VOUTP are received at the energy storage circuitry 602. In other words, the energy storage circuitry 602 receives the differential input signal VINP―VINN and the differential feedback signal VOUTP-VOUTN in alternating fashion. In block 708, the dominant pole fp0 of the signal filter 202 is controlled by controlling the frequency fCLK at which the differential input signal VINP-VINN and the differential feedback signal VOUTP―VOUTN are received at the energy storage circuitry 602. Accordingly, in one embodiment, the present invention provides a signal monitoring system for monitoring an input signal. The signal monitoring system includes, in one embodiment, a switched-capacitor filter to filter the input signal and provides a differential output signal to an ADC. A clock signal controls switches in the signal filter, such that the differential output signal is controlled to be within a desired ranged for the ADC, and a dominant pole of the signal filter is controlled properly. The signal monitoring system can be used in various applications such as multiple-signal monitoring systems, battery monitoring systems, etc. While the foregoing description and drawings represent embodiments of the present invention, it will be understood that various additions, modifications and substitutions may be made therein without departing from the spirit and scope of the principles of the present invention as defined in the accompanying claims. One skilled in the art will appreciate that the invention may be used with many modifications of form, structure, arrangement, proportions, materials, elements, and components and otherwise, used in the practice of the invention, which are particularly adapted to specific environments and operative requirements without departing from the principles of the present invention. The presently disclosed embodiments are therefore to be considered in all respects as illustrative and not restrictive, the scope of the invention being indicated by the appended claims and their legal equivalents, and not limited to the foregoing description. energy storage circuitry coupled to said node and said first and second terminals, and operable for generating said first output signal at said first terminal according to said first input signal and said first reference signal, and operable for receiving said first input signal via said node and said feedback signal via said second terminal in alternating fashion, wherein a dominant pole of said signal filter is controlled by the frequency at which said first input signal and said feedback signal alternate. The signal filter as claimed in claim 1, wherein said energy storage circuitry comprises switched-capacitor circuitry. The signal filter as claimed in claim 1, wherein said energy storage circuitry comprises a capacitor having a first end coupled to receive said first input signal via a first switch and coupled to receive said first reference signal via a second switch, said capacitor having a second end coupled to receive a second reference signal via a third switch and coupled to provide said first output signal via a fourth switch. The signal filter as claimed in claim 3, wherein in a first time interval, said first and third switches are turned on and said second and fourth switches are turned off, and wherein in a second time interval, said first and third switches are turned off and said second and fourth switches are turned on. The signal filter as claimed in claim 3, wherein said energy storage circuitry is operable for receiving said feedback signal via a fifth switch, and wherein said first and fifth switches are turned on in alternating fashion. The signal filter as claimed in claim 1, wherein a differential output signal of said signal filter is given by V'INP―V'INN=(VINP―VINN)―(VREFH―VREFL). where V'INP represents a second output signal of said signal filter, V'INN represents said first output signal, VINP represents said first input signal, VINN represents a second input signal of said signal filter, VREFH represents said first reference signal, and VREFL represents a second reference signal. The signal filter as claimed in claim 6, wherein a maximum absolute value of the difference V'INP―V'INN is less than a maximum absolute value of the difference VINP―VINN. The signal filter as claimed in claim 6, wherein the difference VREFH―VREFL is equal to half of a maximum level of the difference VINP―VINN. The signal filter as claimed in claim 1, wherein said dominant pole increases if said frequency increases, and wherein said dominant pole decreases if said frequency decreases. The signal filter as claimed in claim 1, wherein said first input signal is selected from a plurality of signals, wherein said frequency has a first value when said first input signal is switched from a first signal of said plurality of signals to a second signal of said plurality of signals, and wherein said frequency signal has a second value that is less than said first value when a time interval expires. controlling a dominant pole of said signal filter by controlling the frequency at which said first input signal and said feedback signal are received at said energy storage circuitry. The method as claimed in claim 11, wherein said energy storage circuitry comprises switched-capacitor circuitry. providing said first output signal at said second end of said capacitor in said second time interval. The method as claimed in claim 11, further comprising providing a second output signal, wherein a difference between said first and second output signals is indicative of a difference between said first input signal and a second input signal minus a predetermined level that is within a range of said difference between said first and second input signals. decreasing said frequency to decrease said dominant pole. controlling said frequency to have a second value that is less than said first value when a time interval expires. a signal generator coupled to said signal filter and operable for generating a control signal to control said plurality of switches, and controlling a frequency of said control signal to control a dominant pole of said signal filter. The signal monitoring system as claimed in claim 17, further comprising an analog-to-digital converter coupled to said signal filter and operable for generating a digital signal indicative of a difference between said first output signal and a second output signal of said signal filter. The signal monitoring system as claimed in claim 17, wherein said control signal controls said switches so that, in a first time interval, a capacitor receives said first input signal via a first end of said capacitor and receives a second reference signal via a second end of said capacitor, and wherein in a second time interval, said capacitor receives said first reference signal via said first end and provides said first output signal via said second end. The signal monitoring system as claimed in claim 17, further comprising a multiplexer to select said first input signal from a plurality of signals. The signal monitoring system as claimed in claim 20, wherein said signal generator controls said control signal to have a first frequency when said first input signal is switched from a first signal of said plurality of signals to a second signal of said plurality of signals, and controls said control signal to have a second frequency that is less than said first frequency when a time interval expires.